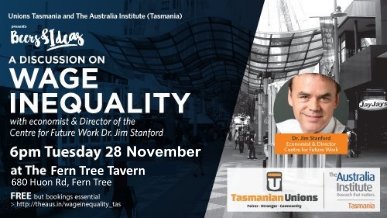 Unions Tasmania and The Australia Institute Tasmania are hosting a discussion on wage inequality with progressive economist, Dr. Jim Stanford. Jim is the Director at the Centre for Future Work based out of The Australia Institute. Wages growth is at record lows while the gap between CEO salaries and average wages keeps ballooning. At the same time, penalty rates are being cut and our minimum wage is way too low. In Tasmania, the average annual wage is about half the national average. There's never been a better time to talk about tackling wage inequality. FREE but bookings essential, as spaces are limited.